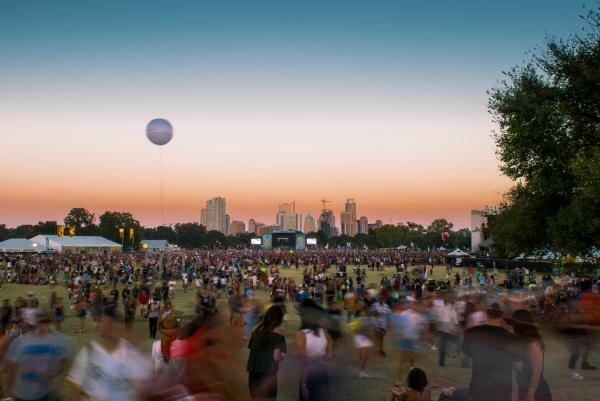 Fall winds are beginning to roll in to Texas and excitement is building as Austinites and music enthusiasts alike count down the days to the 17th annual Austin City Limits Music Festival (October 5-7 and October 12-14). This year, festival-goers will be looking forward to headliners such as Paul McCartney, Metallica and Arctic Monkeys but locals know to look out for Austin’s own home-grown artists, who are credited with making the city the Live Music Capital of the World®. Make sure to get you hands on some tickets and catch these 10 local artists to learn what the ACL vibe is all about. Hometown glory, Asleep at the Wheel, returns to ACL to prove that traditional, western swing music hasn’t faded away. Going strong after 48 years with 10 GRAMMYs, 20 studio albums and 20 singles on the Billboard country charts, the band has become an Austin favorite, booming with energy that has kept they’re a loyal following coming back for more. Now with a new album, Ray Benson and Asleep at the Wheel will bring an 8-piece band along for the ride at this year’s festival. Ironically, the band Sweet Spirit started as a solo project. When Sabrina Ellis started Sweet Spirit, she was still writing and performing with her longstanding garage punk band A Giant Dog. AGD Co-founder Andrew Cashen was intrigued by Ellis&apos; emphasis on soul, country and pop music, leading the two of them to assemble the now 9-piece band. After making two successful records, Cokomo and St.Mojo, they are now working on their third album with GRAMMY-winning engineer Stuart Sikes. Sweet Spirit is a powerful and captivating group that is sure to make an impression this October. Molly Burch channels the sound of 1950s love ballads into delicate indie-rock harmonies. Her debut release off Captured Tracks label (Mac DeMarco, DIIV, Wild Nothing) Please Be Mine earned spots on 2017 best album lists from Gorilla Vs. Bear, Uproxx and Paste Magazine. Molly announced her second album First Flower coming out October 5, 2018 which “is a bright, beautiful album peppered with moments of triumph” according to the press release. Jackie Venson is an "astonishing mix of raw soul, superb musicianship and laid-back grace" (Austin American Statesman, June 2014). Her music combines blues, rock, R&B and soul, which is complimented further by her soulful vocals and instrumental prowess. Her raw emotion and passion are something you can only fully experience live. Curtis Roush, known for his vocals with the band The Bright Light Social Hour, fuses bedroom soul with the ambient expanses of shoegaze in his new solo debut album Cosmic Campfire Music. He composed this album in fleeting moments in motels, a tour van and his parents’ spare bedroom. The music reflects quiet exploration and introspection. Don’t miss his Friday set, exclusively during Weekend Two. A hip-hop/R&B artist born and raised in Austin, Kydd Jones first gained notoriety after performing at NXNE in Toronto and The Brooklyn Hip-Hop Festival in New York City during 2014. He has worked with artists such as Kirko Bangz (300 Entertainment), Yelawolf (Shady Records) and Max Frost (Atlantic Records). Since his debut album, Homecoming, he is currently working on his next album due for late 2018. Superfónicos is a strong fusion of Colombian funk and Caribe soul with a "commanding sound and presence with great vocals and harmonies" according to the NPR Alt. Latino. They create a stage for you to dance and transport you to another place. Don’t miss the unique music of Superfónicos at this year’s festival. Rapper, singer and songwriter, Saul Paul, has earned the reputation of being a “Musician with a Message.” He has performed and shared his journey with TEDx talks, Google, America’s Got Talent and more, and his song “Rise” hit #1 on Sirius XM radio. The combination of his voice, guitar, and loop pedal creates an entertaining and unique live performance. Shakey Graves combines blues, folk and rock and roll in a unique and distinctly Austin sound. His new album released earlier this year, Can’t Wake Up, is an ambitious, audacious work that heralds an artistic metamorphosis for the 30-year-old music veteran. An essential staple in Austin’s live music scene, kick off your Sunday night with Shakey Graves at the Barton Springs stage on both weekends. Feel inspired by Kupira Marimba&apos;s Zimbabwean performance; a high energy, foot stomping, heart pounding, full sensory experience. The group is from South Austin and have been delighting audiences everywhere from 2017 Austin City Limits Music Festival, UTOPiAfest, The Fader Fort at SXSW and many more. They made their debut with album From Austin, With Love in 2016. Catch them on Saturday during Weekend One for a true Austin experience that can&apos;t be beat. Like what you hear so far? Don&apos;t miss your chance to experience the quintessential weekend of live music in Austin - purchase your tickets today!